Portions of the Nashville greenway that runs through MetroCenter remains underwater because of the swollen Cumberland River. Six of Nashville’s greenways remain flooded and partially closed to joggers and bicyclists. With more rain coming, officials say they could stay that way for a while. Many of the city’s greenways run alongside rivers, which are still elevated because of record-setting rain this year. Metro Parks leaders can only guess when the flooded routes will reopen. “I’m thinking weeks,” said Rick Taylor, head of maintenance. His team has barricades out at six greenways, including for three portions of the heavily flooded Stones River Greenway in the Donelson area. Other impacted paths are the Brookmeade, Cumberland River, Peeler Park, Shelby Bottoms and Whites Creek greenways. Some stretches have been immersed several feet deep. 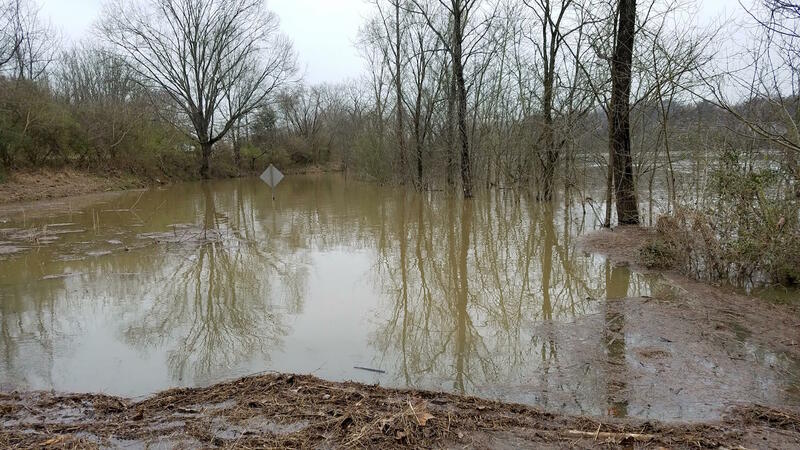 Water was shoulder-high near Ted Rhodes Golf Course on the Cumberland River Greenway, and some bridges are underwater. Once the water clears, Taylor estimates it will take at least a week to inspect the bridges and to check for erosion. He says he has engineers ready to do that as soon as it’s safe. High water covers a portion of the Cumberland River Greenway near the Ted Rhodes Golf Course in MetroCenter. Calvin Gooch surveys the damage to his house with a contractor. Gooch heard the floodwater rising fast around 4 a.m. Thursday — all around the home near North Nashville's Ewing Creek that he shares with his wife and 4-year-old granddaughter.